Cleaning tile floors is easy - by design. To make glazed tile, manufacturers fuse liquid glass to ceramic tile at high temperatures. That makes a hard, nonporous surface. There are many advantages to glazed tile: It doesn't stain, scratch, or burn easily; it's not slippery; and it's easy to clean. 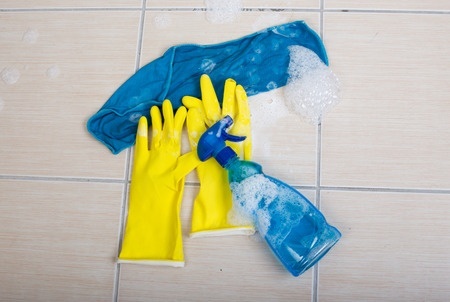 Here's what you need to know about cleaning tile floors to keep them looking their best. To clean a tile floors without marring the shiny surface, your cleaning routine needs to focus on keeping grime from building up, and thereby preventing the need for big-gun cleaners. 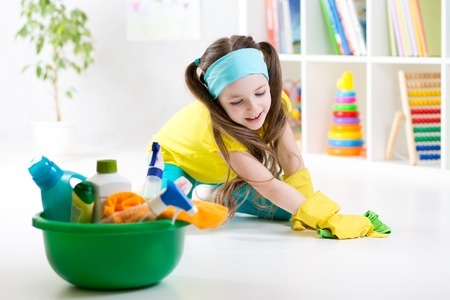 Regularly vacuum and damp-mop tile floors, and clean up spills as they happen. When deep cleaning tile floors, use a neutral-pH cleaner without surfactants (which can leave a residue on tile floors) such as Armstrong Once 'N Done Concentrated floor cleaner, for tough grease-cutting action. Make sure your cleaner has a built-in reinforcing sealer. Avoid abrasive powders that can scratch the tile. Clean tile with a nylon scrub sponge using nonabrasive cleaner and water, and then rinse. Never use wax or a sealant on tile floors. Clean tile grout by scrubbing with detergent, and then apply a diluted solution of chlorine bleach and let sit for five minutes. Then wash again and rinse. If you make sure to clean tile without causing scratches, this flooring in your kitchen or bathroom can last you and the family decades and still look shiny and new.